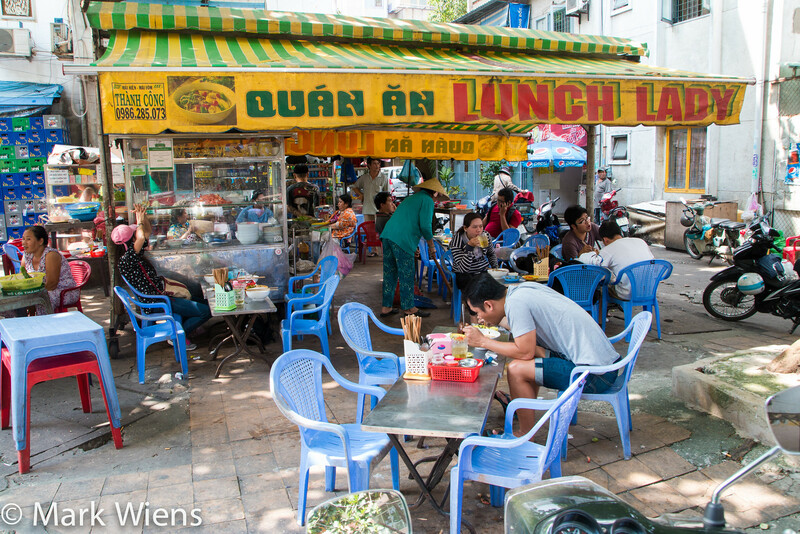 Undeniably, one of the most famous street food stalls in all of Saigon is the legendary Lunch Lady. 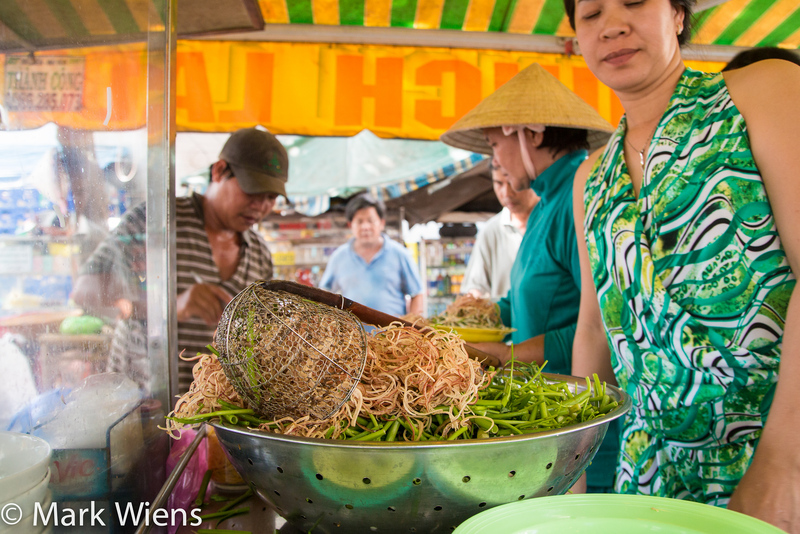 During the course of my trip to Saigon, I ate an incredible amount of delicious food, but I couldn’t leave without getting a taste of the noodles dished out by Nguyen Thi Thanh – the Lunch Lady herself. Anthony Bourdain, on his show No Reservations, ate at the Lunch Lady and loved everything from the noodles to the atmosphere, and he has undoubtedly boosted the street food stalls fame and popularity. But along with Anthony Bourdain, the Lunch Lady was and still is famous for locals in the neighborhood. On one of my final days in Saigon, I finally had a chance to go. The Lunch Lady specializes in serving noodles, noodle soups to be more specific. 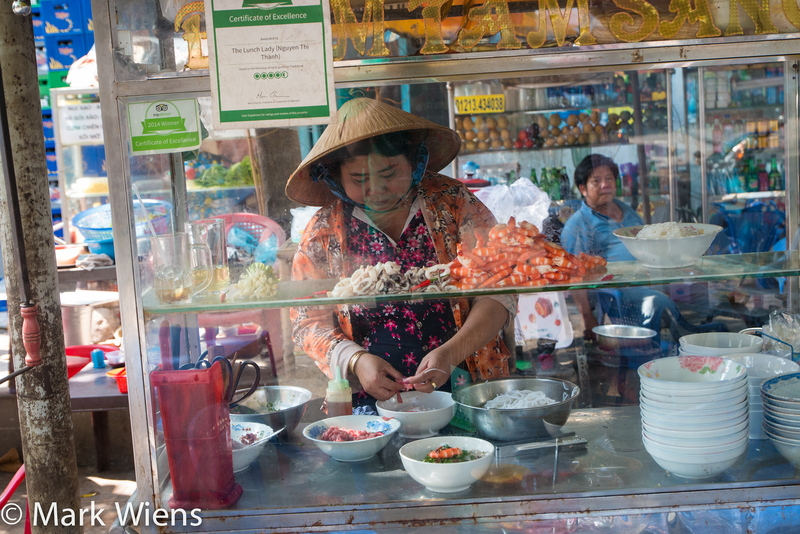 Everyday of the week, she rotates her menu and serves a different Vietnamese noodle dish, but just one dish per day. This is the first time I’ve seen a food vendor sell a different dish each day of the week, almost like an organized, well planned out cafeteria – and I thought it was a fantastic idea. Imagine if you worked at an office in that area, you could go everyday for lunch and eat a different noodle dish each day without getting bored! But rather than going to the Lunch Lady on her most famous day, Friday, when she serves Bun Bo Hue (I tried it at a different restaurant), I decided to go on Monday when she was serving Bún Thái, a Vietnamese Thai noodle soup. Being a Thai food lover, I thought it would be an interesting opportunity to taste the fusion of Thai and Vietnamese noodles in a single bowl, served by none other than the legendary Lunch Lady. For a full menu of what the Lunch Lady serves each day, check out this great guide. When we arrived to the street food stall, it was right at noon, and the street food stall was packed out. Luckily, there were a couple seats and plastic tables right at the base of where the Lunch Lady was serving her noodles, literally right in front of the glorious glass display cabinet. 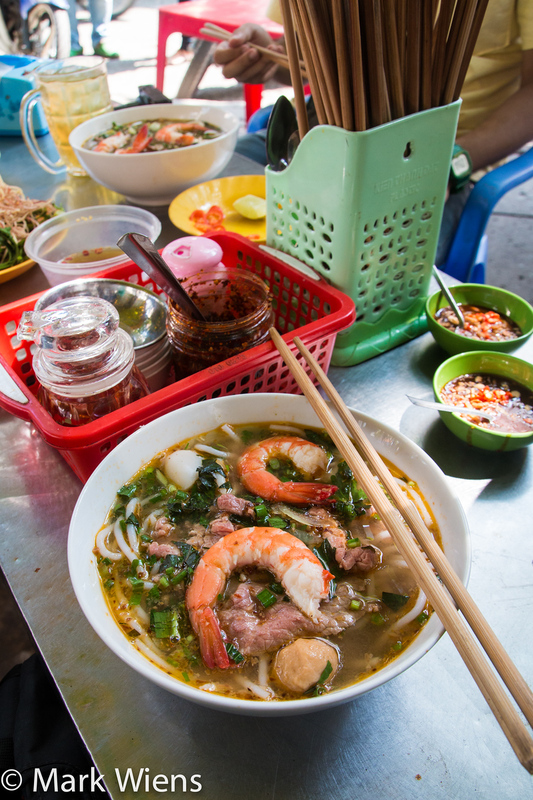 Sitting down for lunch, I had a fantastic view of the Lunch Lady expertly assembling bowls of noodles, and I could peer directly into the supply of pork and blanched prawns – nothing better than street food front row seating. Along with the main glass cabinet display, there was a bubbling pot of soup broth sitting on the side, plus mounds of vegetables patiently waiting to be served with noodles. The shredded morning glory and banana blossoms were flash boiled before being served. I proceeded to order the big sized bowl of bun Thai. Even though the street food stall was bustling, it didn’t take longer than a few moments for our noodles to arrive at our table, nice and piping hot. I immediately loved how colorful and how well decorated the noodles came. On the bottom was a handful of bun, or rice noodles, and they were of the spaghetti size variety. On top of the noodles were some slices of slightly cooked beef, a couple rings of squid, an assortment of chopped herbs and vegetables, and then finally a couple of the pre-blanched prawns laid on top. The soup had a wonderful sweet and sour aroma, with both an earthy and citrusy smell to it. Before seasoning my own bowl with chili and the extra condiments provided at the table, I first sampled the broth. It was very similar to how it smelled, and it did have a similar Thai tom yum sour flavor, with a bit of extra sweetness. For myself, one of the main reasons I eat noodle soup, is for the chance to dress it and add condiments to make it perfect for my taste. Chili is my personal favorite condiment, so you can be sure I loaded up my broth with dry chili oil, which I think included some fried toasted garlic as well. I also squeezes in a few wedges of lime. The chili sauce gave the noodles a fantastic boost of heat and a smoky dry chili flavor. Overall, I was very satisfied with my bowl of bun Thai. Perhaps the broth was just a little too sweet, but I loved the sourness, and the complex fruity flavor, balanced with the fresh herbs and the spicy garlicky chili sauce. Additionally, I thought the price was pretty reasonable in comparison to other noodle restaurants in Saigon, and the portion size and ingredients were quite generous. Right next to the main Lunch Lady noodle cart is another smaller stall that serves goi cuon, Vietnamese fresh summer rolls. I’m not fully sure, but I think the goi cuon stand is owned and operated by relatives of the Lunch Lady, and they seemed to promote the summer rolls as part of a full meal along with the noodles. 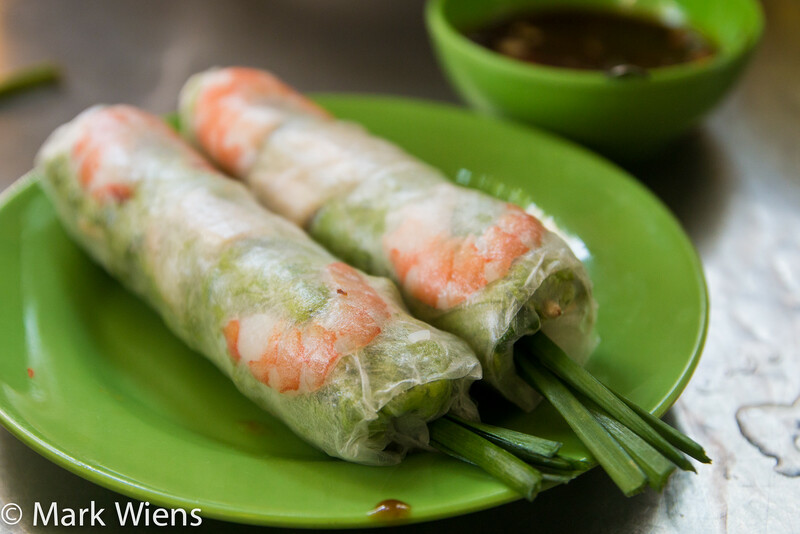 I’m not one to turn town goi cuon as they are one of my favorite refreshing Vietnamese snacks, and so we got an order. I was quite impressed with the goi cuon, they were extremely good. The rolls were stuffed with a good quantity of lettuce, basil, shrimp, and what I really loved was all of the chives, poking out from the top of the roll, offering a slight mellow onion flavor. The sauce was of the brown hoisin variety, with a small scoop of both crushed peanuts and chilies on top. 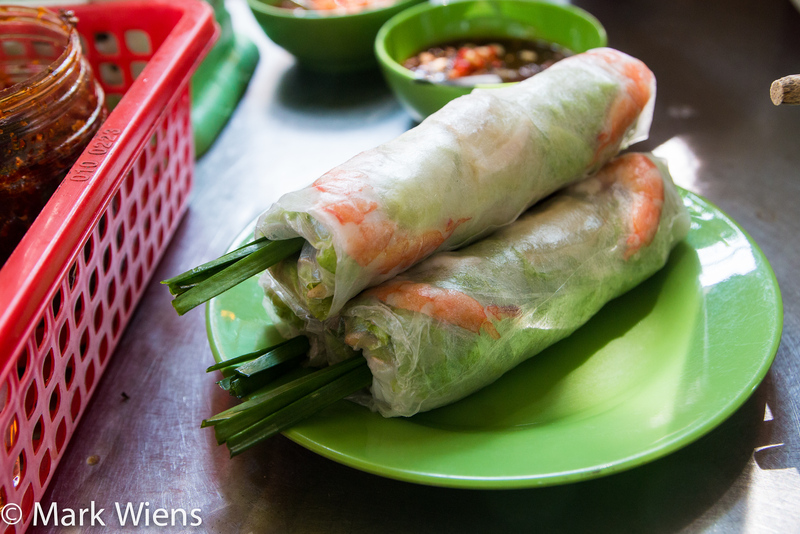 If you go to the Lunch Lady in Saigon, don’t miss ordering the fresh summer rolls. The Lunch Lady is one of the most well known Vietnamese street food stalls in Saigon, a restaurant Anthony Bourdain visited and deeply loved. 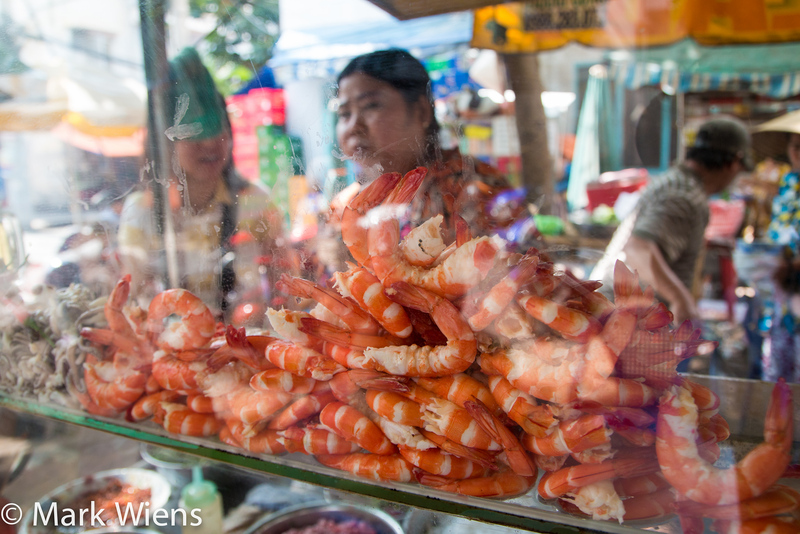 When I was in Saigon, I was excited to get a taste of this legendary street food stall. Nguyen Thi Thanh, known famously as The Lunch Lady, serves a different Vietnamese noodle dish each day of the week, and I chose to go on Monday to try her version of bun Thai. 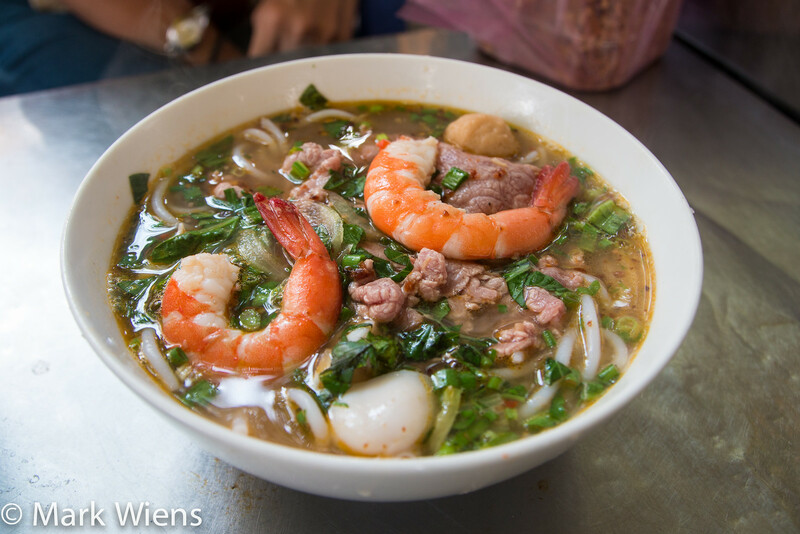 The bowl of noodles came well decorated, with a generous amount of meat, shrimp, herbs, and side vegetables. The soup was sweet and sour, slightly spicy, and nicely balanced. Not only were the noodles fantastic and I thought the portion size was generous, but the Lunch Lady was also an extremely kind lady, and her passion for cooking and serving shined. 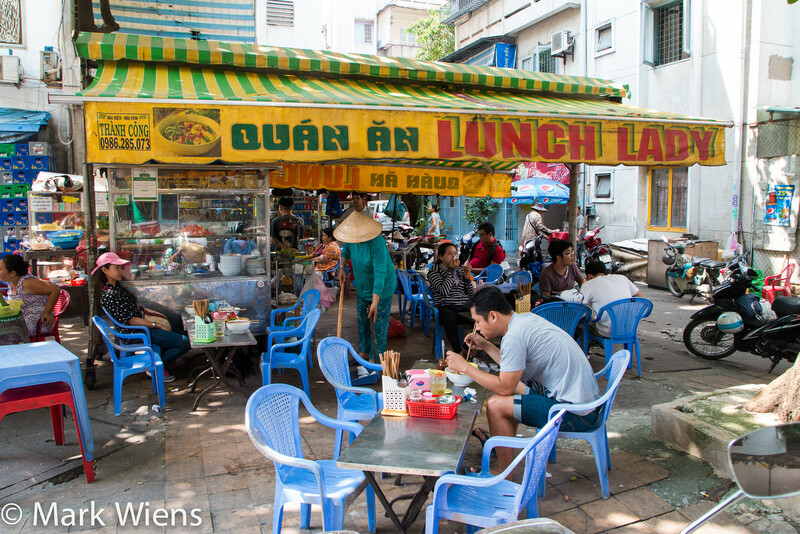 And just as Anthony Bourdain mentioned, sitting in the shade of the big trees with a continual breeze, removed from the chaos of motorbikes on the main roads of Saigon, the atmosphere at the Lunch Lady could hardly get better. Open hours: I believe she’s open from at least 9 am – 3 pm, it’s best to eat here for lunch. Possibly open for dinner, but I’m not sure. How to get to the Lunch Lady: The street food stall is located not far from central Saigon, and just a 5 – 10 minute walk from the zoo. The easiest way to get there would be to take a taxi directly there, but I got there by taking a bus along Nguyen Thi Minh Khai, got off at the zoo, and walked from there. For the map, scroll down and click on “The Lunch Lady,” and it will highlight the correct position. Is the menu provided by Lunch Lady every day the same? or have a different special menu every day? is the lunch lady open on weekends? Beware, prices quoted differ per customer… esp for foreigners who dont ask beforehand. So sorry I did not know of your blog before our last trip to HMMC Mark, very well done blogs on my favourite subject, food! Well done, and I hope to visit The Lunch Lady on our next trip. On related note; when cities become too big and modern they tend to loose their cultural and food identity, and the old ways disappear (as a former resident of Hong Kong that place is a classic example, there are virtually no food markets and street food stalls left there selling popular local foods). Let’s all hope that places such as HCMC aand Hanoi do not go down that track! Mark…love your videos ..and your spirit. You present information in such a straightforward, clear way and with such enthusiasm. My husband and I are going to Vietnam in 3 days and we have been devouring all the info we can find …will be checking out the Lunch Lady for sure! Thanks for the great videos and the way you put interactive links…very helpful! Hey Jodi, thank you for reading, and so glad the info has been helpful. Hope you and your husband have an incredible stay in Vietnam. Thank you very much Mal, really appreciate it. Yah, that’s part of the reason I love to travel slowly, so that I can take my time to create content as I go. Enjoy your pho! Hi Mark! Thanks for your tips! I went to Saigon last year and I’m coming back this August. Can’t wait to eat at the Lunch Lady. I’m drooling while looking at your videos. Godspeed! Thank you Joy. Great to hear you’ll be going in August. You are the real experience tester, sometime you can find Indonesian Food as well. Thank you Zulian. I’m hoping to visit Indonesia this year. 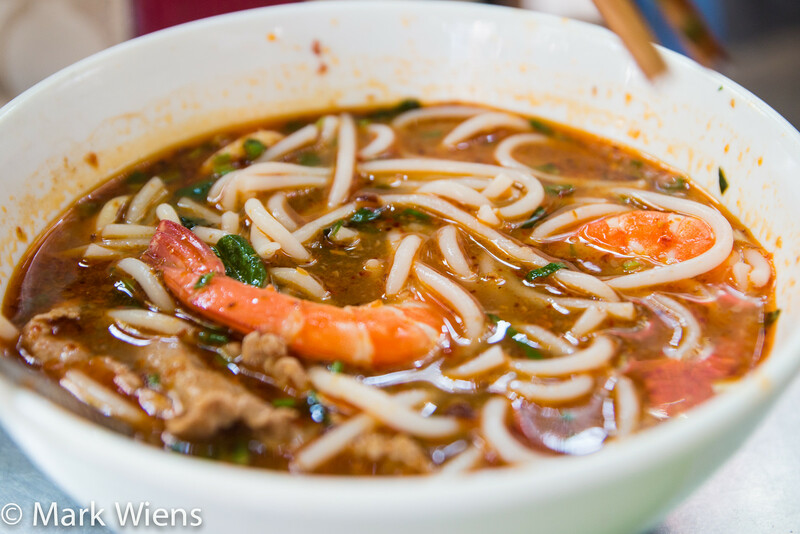 I went to Vietnam a few times but haven’t tried her Bun Bo Hue. Bun Bo Hue is one of my favorite soup. Thanks for the suggestion, I will have make a visit next time I am in Vietnam. Hi Maria, great to hear from you. Yah, I haven’t tried the Bun Bo Hue from The Lunch Lady either, but I think it looks pretty good. Let me know if you try it on one of your trips. Just wondering how spicy is this food, are the rolls made from lettuce, basil, shrimp, fried or boiled? Great clear images, thank you. Hey Wafa, thank you very much. I thought it wasn’t very spicy, but I did add some extra chilies which increased the spicy, but with no extra chilies it was pretty mild. The noodles look so good!! I love sour, sweet, and chili heat in a bowl. I went to the Lunch Lady for Bun Thai as well and loved it! 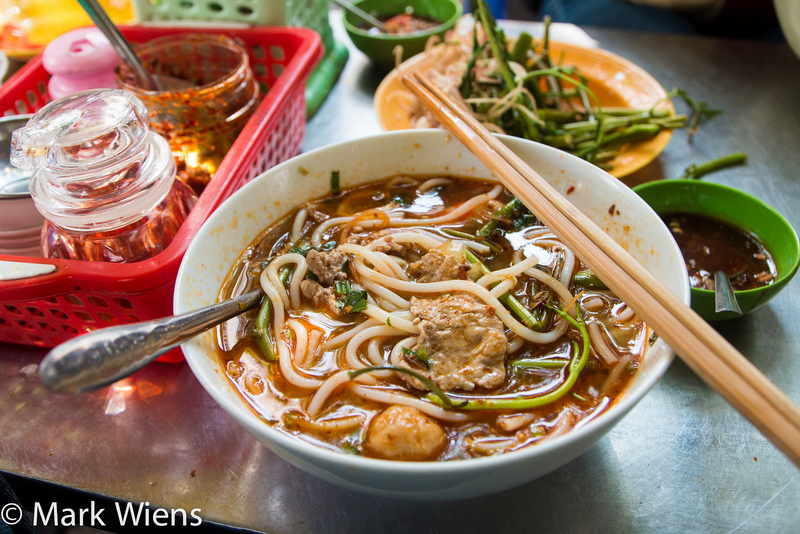 Would have gone back for Bun Bo Hué but had to leave Saigon before that… next time! Sounds good Edwina, glad we had the same day!